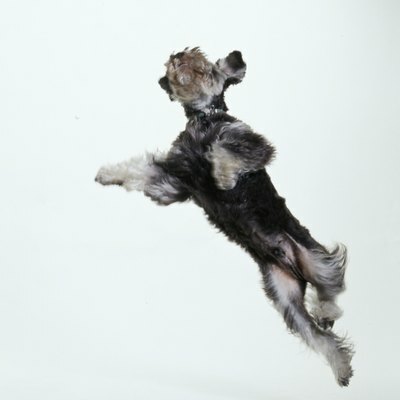 Jumping may be a cute trick, but it can turn into a dangerous habit. Gates are meant to keep your puppy in a safe place, but many puppies think life is better on the other side of the fence. If your pup’s jumping over the gate like a baby goat, a little training and positive reinforcement will teach her to stay where she belongs. Increase the height of the gate to deter a problem jumper. If your pup’s jumping an inside gate, such as a baby gate, stack a second gate on top of the first to make a jump-proof barrier. Extend an outside gate by attaching a section of chicken wire to the top of the gate to keep your pooch in the yard. Crate your puppy if you’re not able to supervise her. Unsupervised puppies can get into a ton of trouble, so keep your pooch in her kennel during busy moments. Give her a treat or toy to keep her amused while crated. Teach the puppy to stay on the proper side of the gate. Quietly observe her while she explores the fence. If she moves toward the gate as if to jump it, call her back to you and give her a treat. Call and reward her every time you see her moving toward the gate, and she will learn to associate staying on her side with a tasty reward. Tether the puppy to you with a leash to keep her away from the gate. Clip a leash to her collar and hold it in your hand or feed it through your belt loop for hands-free puppy control. Place a deterrent mat on the other side of the fence. These mats have a rough texture and emit an irritating sound to chase off unwanted pets. Set the mat in the general landing area on the opposite side of the gate, and let your dog jump over the gate. As soon as she lands, she’ll be assaulted by uncomfortable feet and strange noises and will learn that staying on her side of the fence prevents this discomfort. Don’t use a mat that shocks your dog. While many companies claim they work, shocking could be hazardous to your pup’s health. "How to Make a Puppy Stop Jumping, Biting & Pulling on Clothes When Walking"
What Is a Dog Steeplechase?